I was recently made aware of a 2010 analysis that was done by Baylor University’s Office of Institutional Research and Testing. It compared first-time Baylor freshman who were homeschool graduates to the rest of Baylor’s first-time freshman population over a period of four years. I think the results will be helpful to those who are wondering whether or not home education adequately prepares a student for the academic rigors of university. In general, the way you treat error bars is to assume that the measurement can actually be anywhere within the range of the error bar. For the homeschool graduates, then, the measured average was 3.364. However, based on the error bar, it could actually be anywhere from 3.090 to 3.638. For the non-homeschool graduates, the measured average was 3.038, but it could actually be anywhere from 3.012 to 3.064. The important thing to note is that even if you take the lowest value for the homeschool graduates and the highest value for the non-homeschool graduates, the average for the homeschool graduates is still higher. This means the analysis provides strong evidence that the average homeschool graduate does better than the rest of the population during his or her freshman year at Baylor. While I find that interesting, I think a more detailed look at the data is even more interesting. In the graph, the blue bars represent the homeschool graduates, while the red bars represent the non-homeschool graduates. Notice that for GPAs under 2 (below a “C”), there are more non-homeschool graduates than homeschool graduates. This is also true for GPAs between 2.0 and 2.999 (“C” to “C+”). 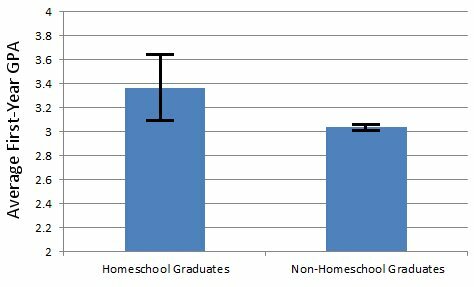 However, there are more homeschool graduates between 3.0 to 3.9999 (“B” to “B+”), and significantly more homeschool graduates with 4.0’s (which means they got straight “A’s” their freshman year). So what does this indicate? It indicates that at Baylor University, the homeschool graduates are the better freshman students. They not only have a higher freshman GPA, but they are also significantly more likely than the rest of the population to get straight A’s their freshman year. Now…does this mean that homeschool graduates are more successful at all universities? Not necessarily. It might mean that Baylor is better at finding homeschool graduates who will be successful than it is at finding non-homeschool graduates who will be successful. However, I find that unlikely. 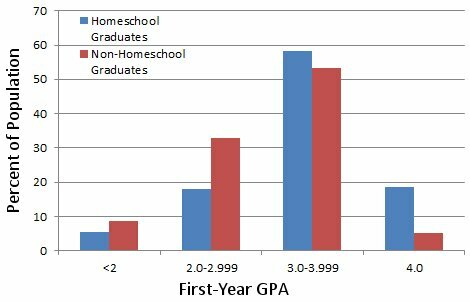 Also, when you combine these results with other studies that indicate homeschool graduates are more successful at university than the rest of the population, I think that the most reasonable conclusion is that homeschooling provides the best preparation for university. That has always been my expectation, given my experience with homeschool graduates and homeschooled students. It is nice to see that the data are confirming my expectation. * Please note that the analysis itself did not include the error bars. I calculated the error bars given the sample sizes that were reported in the analysis. What if someone were to argue that homeschoolers do better due to being predominantly drawn from demographic groups which tend to have higher academic performance? I’ve seen various studies showing better performance by homeschoolers, but the studies I’ve seen have never seemed to really consider the demographic question as much as I’d like. Winston, there are studies that have addressed that question. 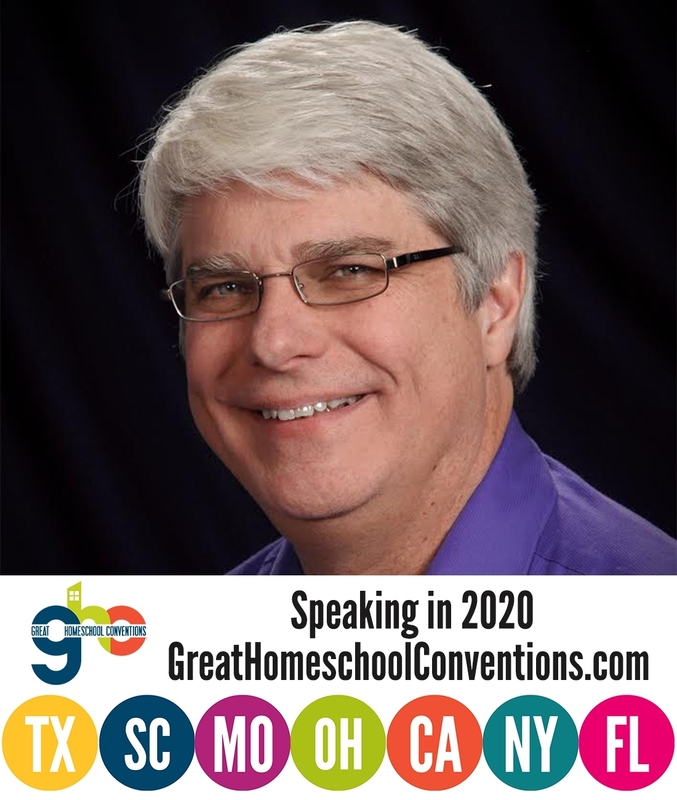 For example, Ray’s 1997 study, Home Education Across the United States, had a section that showed the academic achievement of homeschooled students is not affected much by the parents’ education level. Another study of his in 2009 showed essentially the same thing. Thanks. That really answered my question! It’s nice to see my anecdotal evidence from being a homeschool graduate college student who knows a few homeschoolers at college being supported by an actual study. Are there any studies that show if higher GPAs on average are maintained throughout the entire college career? Thanks for your anecdotal evidence, Vivielle. When “they” say Christianity and science are diametrically opposed, “they” are only demonstrating their ignorance of both. In answer to your question, there is at least one study that indicates homeschool graduates maintain their higher-than-average GPAs throughout their college experience. A study done at the University of St. Thomas shows that while the gap between the rest of the population and homeschool graduates diminishes a bit over time, even in their fourth year, homeschool graduates maintain a higher GPA.